YBN 2 Tone Colored Single Speed Bicycle Chain. 1/2" x 1/8" comes in Colors: Black, Blue, Green, Red, Yellow, White, & Silver. Perfect for Antique Schwinn Cruisers, Vintage Bicycle, or Custom Chopper Lowrider, Fixed Gear Single Speed Track Townie. Quality look and Performance for your Bike. 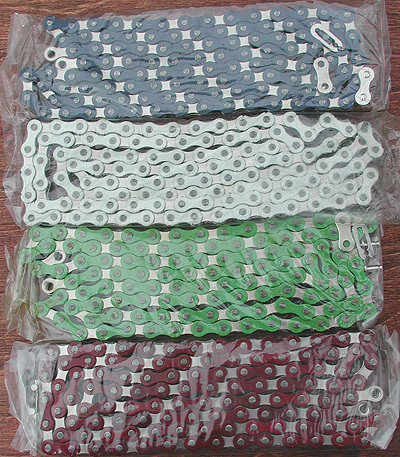 Quality YBN 2 Tone Colored Single Speed Chain, works on all single speed bikes with single sprocket drive. 1/2" is the link length and 1/8"is its width. Chain comes full length with a Master link. You may need chain tool to remove links to fit your bike, we have a chain tool in our tools section. These Chains are Industrial Painted chains, Definitely Cool and Tough, but these chains can wear faster than other finishes, keep clean for best look and Performance. Quality look and performance for your vintage bicycle restoration or custom chopper project.